BELARIUS, GUIDERIUS, ARVIRAGUS, and IMOGEN enter from the cave. [To IMOGEN] You are not well: remain here in the cave;We'll come to you after hunting. [To IMOGEN] You aren't feeling well. Stay here in the cave. We'll come back to see you after hunting. [To IMOGEN] Brother, stay here.Are we not brothers? [To IMOGEN] Brother, stay here. We're brothers, aren't we? So man and man should be;But clay and clay differs in dignity,Whose dust is both alike. I am very sick. Just as men should be to each other. But some men are thought to be worth more than others, even though they're made out of the same stuff. I am very sick. You go hunting. I'll stay with him. So sick I am not, yet I am not well; But not so citizen a wanton as To seem to die ere sick: so please you, leave me; Stick to your journal course: the breach of custom Is breach of all. I am ill, but your being by me Cannot amend me; society is no comfort To one not sociable: I am not very sick, Since I can reason of it. Pray you, trust me here: I'll rob none but myself; and let me die, Stealing so poorly. I'm not that sick, although I'm not well. But I won't be like a weak city person and act like I'm dying when I'm just sick. Please, leave me alone. Do what you usually do all day. There's nothing worse than breaking a routine. I am sick, but you staying with me won't make me better. Company is no help for someone who's antisocial. I'm not very sick, since I can talk reasonably. Please, trust me to stay here. I won't rob anyone except myself. Let me die and steal only from myself. I love thee; I have spoke itHow much the quantity, the weight as much,As I do love my father. I love you. I have already told you how much, and how deeply: as much as I love my father. If it's a sin to say that, I'll sin too along with my brother. I don't know why I love this young man. I have heard you say that the reason for love is unreasonable. If a coffin were at the door and we were told someone had to die, I'd say, "My father, not this young man." [Aside] O noble strain! O worthiness of nature! breed of greatness! Cowards father cowards and base things sire base: Nature hath meal and bran, contempt and grace. I'm not their father; yet who this should be, Doth miracle itself, loved before me. 'Tis the ninth hour o' the morn. [To himself] What a noble thing to say! They're so naturally virtuous! And high-born! Cowards give birth to cowards and low things give birth to low things. Nature is like grain: it contains flour that you keep and bran you throw away. In the same way, there are low and high people. I am not their father. I have no idea who this person is they love more than me. [To the others] It's nine in the morning. Get better. Let's go, sir. [Aside] These are kind creatures. Gods, what lies I have heard! Our courtiers say all's savage but at court: Experience, O, thou disprovest report! The imperious seas breed monsters, for the dish Poor tributary rivers as sweet fish. I am sick still; heart-sick. Pisanio, I'll now taste of thy drug. [To herself] These are kind people. I've been told such terrible lies! Our courtiers say everyone who isn't at court is a savage! But my experience shows this isn't true! The seas contain monsters, but the fish that live in little rivers taste just as good. I am still sick—sick with sadness. Pisanio, I'll try your medicine. I could not stir him:He said he was gentle, but unfortunate;Dishonestly afflicted, but yet honest. I couldn't get him to tell me anything. He said he was a noble, but in a bad situation. He was in trouble, but an honest man. Thus did he answer me: yet said, hereafterI might know more. He answered me in the same way. But he said I might learn more later. To the field, to the field!We'll leave you for this time: go in and rest. Let's go, let's hunt! We'll leave you for now. Go inside and rest. We won't be away for long. Pray, be not sick,For you must be our housewife. Please, don't be sick. You have to be our housewife. Well or ill,I am bound to you. Sick or healthy, we're in this together. IMOGEN exits, to the cave. This youth, how'er distress'd, appears he hath hadGood ancestors. This young man seems like he's in trouble, but like he's from a good family. He sings like an angel! But his neat cookery! he cut our roots In characters, And sauced our broths, as Juno had been sick And he her dieter. And his cooking! He cut our root vegetables into the shapes of letters, and made our soups taste so good that it was as though the goddess Juno were sick and he were in charge of feeding her. Nobly he yokes A smiling with a sigh, as if the sigh Was that it was, for not being such a smile; The smile mocking the sigh, that it would fly From so divine a temple, to commix With winds that sailors rail at. Nobly, he smiles but sighs, as if the sigh was sighing because it wasn't a beautiful smile. The smile makes fun of the sigh, because it flies out from its holy home in that boy to mix with winds that sailors swear at. I do noteThat grief and patience, rooted in him both,Mingle their spurs together. I did notice that he seemed to be feeling a combination of sadness and patience, as though those feelings were plants growing together. Grow, patience!And let the stinking elder, grief, untwineHis perishing root with the increasing vine! I hope that patience grows! And that grief, a stinking tree, separates its dying root from the growing vine of patience! It is great morning. Come, away!—Who's there? It's midmorning. Come on, let's go—who's there? I cannot find those runagates; that villainHath mock'd me. I am faint. I can't find those runaways. That thug was lying to me. I feel faint. 'Those runagates!' Means he not us? I partly know him: 'tis Cloten, the son o' the queen. I fear some ambush. I saw him not these many years, and yet I know 'tis he. We are held as outlaws: hence! "Those runaways!" He must mean us! I sort of know him. It's Cloten, the queen's son. I'm worried there are people here to ambush us. I haven't seen him for years, but I know it's him. We're outlaws. Let's go! He is but one: you and my brother searchWhat companies are near: pray you, away;Let me alone with him. There's only one of him. You and my brother should look to see if there are other people here. Go, please. Leave me alone with him. Soft! What are youThat fly me thus? some villain mountaineers?I have heard of such. What slave art thou? Wait! Who are you, running at me like that? Some mountain-climbing bandit? I have heard of those people. What kind of slave are you? A thingMore slavish did I ne'er than answeringA slave without a knock. I never did anything more slavish than what I'm doing right now: answering a slave without hitting him. Thou art a robber,A law-breaker, a villain: yield thee, thief. You're a robber, a law-breaker, a thug. Surrender, thief. To who? to thee? What art thou? Have not I An arm as big as thine? a heart as big? Thy words, I grant, are bigger, for I wear not My dagger in my mouth. Say what thou art, Why I should yield to thee? To who? To you? Who are you? Don't I have an arm as strong as yours? A heart that's just as good? Your words are stronger, but that's because I don't insult strangers. Tell me who you are. Why would I surrender to you? Thou villain base,Know'st me not by my clothes? You low thug, don't you know who I am from my clothes? No, nor thy tailor, rascal,Who is thy grandfather: he made those clothes,Which, as it seems, make thee. No, or from your tailor, you good-for-nothing, who I bet is your grandfather. He made your clothes, and it seems that your clothes make you who you are. Thou precious varlet,My tailor made them not. You ridiculous criminal, my tailor didn't make them. Hence, then, and thankThe man that gave them thee. Thou art some fool;I am loath to beat thee. Go away, then, and go thank the man who gave them to you. You're some fool. It would be wrong to beat you up. Thou injurious thief,Hear but my name, and tremble. You insulting thief, hear my name and be afraid. Cloten, thou double villain, be thy name, I cannot tremble at it: were it Toad, or Adder, Spider, 'Twould move me sooner. Cloten, you double thug, if that's your name, fine, but I can't be afraid of it. If it were Toad, or Snake, or Spider, it would be more likely to scare me. To thy further fear,Nay, to thy mere confusion, thou shalt knowI am son to the queen. To scare you more, to completely overwhelm you, I'll tell you I'm the queen's son. I am sorry for 't; not seemingSo worthy as thy birth. I'm sorry to hear it. You don't live up to your noble family. Those that I reverence those I fear, the wise:At fools I laugh, not fear them. I'm afraid of the people I respect, wise people. I laugh at fools—I'm not afraid of them. Die the death: When I have slain thee with my proper hand, I'll follow those that even now fled hence, And on the gates of Lud's-town set your heads: Yield, rustic mountaineer. Die, then. When I have killed you with my own hand, I'll keep following those people who ran away just now, and I'll stick all of your heads on the gates of Lud-town. Surrender, you hillbilly. You didn't see any soldiers out there? Not a single one. You must have gotten him confused with someone else. I cannot tell: long is it since I saw him, But time hath nothing blurr'd those lines of favour Which then he wore; the snatches in his voice, And burst of speaking, were as his: I am absolute 'Twas very Cloten. I can't tell. It's a long time since I saw him, but time hasn't made me forget what he looked like. The sound of his voice and the way he speaks in short bursts sounded like what he remembered. I'm absolutely sure it was Cloten himself. In this place we left them:I wish my brother make good time with him,You say he is so fell. We left them here. I hope my brother deals with him quickly, since you say he's so dangerous. Being scarce made up, I mean, to man, he had not apprehension Of roaring terrors; for the effect of judgment Is oft the cause of fear. But, see, thy brother. When he was barely grown up, he wasn't afraid of the most horrible danger. Having good judgement is often what makes you afraid. There's your brother. GUIDERIUS re-enters, holding CLOTEN's head. This Cloten was a fool, an empty purse; There was no money in't: not Hercules Could have knock'd out his brains, for he had none: Yet I not doing this, the fool had borne My head as I do his. This Cloten fellow was a fool, like an empty purse with no money in it. Even Hercules couldn't have knocked out his brains, because he didn't have any. But if I hadn't done this, the fool would have been carrying my head the way I'm carrying his. I am perfect what: cut off one Cloten's head, Son to the queen, after his own report; Who call'd me traitor, mountaineer, and swore With his own single hand he'ld take us in Displace our heads where—thank the gods!—they grow, And set them on Lud's-town. I know exactly what I did: cut off some man Cloten's head, a son of the queen according to him. He called me a traitor, a mountain bandit, and promised that he himself would take our heads off the necks they grow on now (thank the gods!) and stick them on the gates of Lud's-town. Why, worthy father, what have we to lose, But that he swore to take, our lives? The law Protects not us: then why should we be tender To let an arrogant piece of flesh threat us, Play judge and executioner all himself, For we do fear the law? What company Discover you abroad? But father, what do we have to lose except what he promised he'd take, our lives? The law doesn't protect us, so why should we let an arrogant lump threaten us and play at being a judge and executioner all by himself, because we're afraid of the law? How many soldiers did you see around here? No single soul Can we set eye on; but in all safe reason He must have some attendants. Though his humour Was nothing but mutation, ay, and that From one bad thing to worse; not frenzy, not Absolute madness could so far have raved To bring him here alone; although perhaps It may be heard at court that such as we Cave here, hunt here, are outlaws, and in time May make some stronger head; the which he hearing— As it is like him—might break out, and swear He'ld fetch us in; yet is't not probable To come alone, either he so undertaking, Or they so suffering: then on good ground we fear, If we do fear this body hath a tail More perilous than the head. We didn't see a single one, but we should assume he had attendants with him. Although he was unpredictable and went from one bad idea to another, it wasn't complete madness that brought him so far from court alone. Although maybe it was said at court that people like us who live in caves here and hunt here are outlaws and could band together to be stronger. He heard this and it's very likely that he stood up and promised he'd round us up. But it's not likely either that he would want to come alone or that they would let him. We should worry that he was the head of a company of dangerous soldiers. Let ordinanceCome as the gods foresay it: howsoe'er,My brother hath done well. Let the future go the way the gods want it to. However it goes, my brother did the right thing. I had no mindTo hunt this day: the boy Fidele's sicknessDid make my way long forth. I didn't feel like hunting today. The boy Fidele's sickness was weighing on me all the way here. With his own sword, Which he did wave against my throat, I have ta'en His head from him: I'll throw't into the creek Behind our rock; and let it to the sea, And tell the fishes he's the queen's son, Cloten: That's all I reck. I took his head from him with his own sword, which he waved at my throat. I'll throw that sword into the stream behind our cave, and let it float to the sea and tell the fish he's the queen's son, Cloten. That's all I have to say. I fear 'twill be revenged:Would, Polydote, thou hadst not done't! though valourBecomes thee well enough. I'm worried they'll get their revenge for this. I wish you hadn't done this, Polydore! Though your bravery is a credit to you. Would I had done't So the revenge alone pursued me! Polydore, I love thee brotherly, but envy much Thou hast robb'd me of this deed: I would revenges, That possible strength might meet, would seek us through And put us to our answer. I wish I had done it so I was the only one who would be punished! Polydore, I love you as a brother but I'm jealous because you robbed me of the opportunity to kill him. I hope they follow us looking for revenge so we can fight them. Well, 'tis done: We'll hunt no more to-day, nor seek for danger Where there's no profit. I prithee, to our rock; You and Fidele play the cooks: I'll stay Till hasty Polydore return, and bring him To dinner presently. Well, it's done. We won't hunt any more today, or look for danger pointlessly. Please, let's go back to our cave. You and Fidele cook something. I'll stay here until reckless Polydore returns, and bring him home for dinner soon. Poor sick Fidele! I'll weringly to him: to gain his colour I'ld let a parish of such Clotens' blood, And praise myself for charity. Poor sick Fidele! I'll hurry back to him. To make him look less pale I'd stab a whole parish full of fools like Cloten and be proud of my good deed. O thou goddess, Thou divine Nature, how thyself thou blazon'st In these two princely boys! They are as gentle As zephyrs blowing below the violet, Not wagging his sweet head; and yet as rough, Their royal blood enchafed, as the rudest wind, That by the top doth take the mountain pine, And make him stoop to the vale. 'Tis wonder That an invisible instinct should frame them To royalty unlearn'd, honour untaught, Civility not seen from other, valour That wildly grows in them, but yields a crop As if it had been sow'd. Yet still it's strange What Cloten's being here to us portends, Or what his death will bring us. Oh you goddess, holy Nature, you show yourself so clearly in these two princely boys! They are as gentle as breezes blowing around a violet without shaking it, but as rough when they get angry as the strongest wind that knocks a pine down from a mountain into a valley. It's amazing how by instinct they act like royalty, with honor that was never taught to them, politeness that is unmatched in anyone, and bravery that grows wild but grows as well as if it were deliberately planted. But I don't know what Cloten being here means for us, or what the consequences of his death will be. Where's my brother? I have sent Cloten's clotpoll down the stream, In embassy to his mother: his body's hostage For his return. Where's my brother? I sent Cloten's head down the stream, with a message to his mother. His body stays here as a hostage to make sure he comes back. My ingenious instrument!Hark, Polydore, it sounds! But what occasionHath Cadwal now to give it motion? Hark! My instrument! Listen, Polydore, it's being played! But why has Cadwal brought it out? Listen! He went hence even now. What does he mean? since death of my dear'st mother it did not speak before. All solemn things Should answer solemn accidents. The matter? Triumphs for nothing and lamenting toys Is jollity for apes and grief for boys. Is Cadwal mad? What is he doing? It hasn't been played since my dear mother died. You should only seem to be sad because something sad has happened. What's going on? Celebrating over nothing and crying over nothing is happiness fit only for apes and sadness for boys. Is Cadwal crazy? Look, here he comes,And brings the dire occasion in his armsOf what we blame him for. Look, here he comes, and carries in his arm the sad thing we were saying he should be responding to. ARVIRAGUS re-enters, carrying IMOGEN, who seems dead, in his arms. The bird is dead That we have made so much on. I had rather Have skipp'd from sixteen years of age to sixty, To have turn'd my leaping-time into a crutch, Than have seen this. The bird we were so fond of is dead. I would rather have skipped from sixteen years old to sixty, to give up my leaping time in my youth for a crutch, than see this. O sweetest, fairest lily!My brother wears thee not the one half so wellAs when thou grew'st thyself. Oh, sweetest, most beautiful lily! Your brother isn't wearing you half as well on his arms as you wore yourself when you were alive. O melancholy! Who ever yet could sound thy bottom? find The ooze, to show what coast thy sluggish crare Might easiliest harbour in? Thou blessed thing! Jove knows what man thou mightst have made; but I, Thou diedst, a most rare boy, of melancholy. How found you him? Oh, this is a bottomless sorrow! It's like a deep sea with no mud on the bottom to make you hope you were approaching a harbor with your slow sadness! You blessed thing! Jove knows what kind of man you would have become. But I know you died as a unique boy, of sadness. How did you find him? Stark, as you see: Thus smiling, as some fly hid tickled slumber, Not as death's dart, being laugh'd at; his right cheek Reposing on a cushion. Dead, as you see. Smiling like this, as though he had been tickled by a fly while sleeping, laughing as though death's arrow had not hit him, lying on his right side. O' the floor; His arms thus leagued: I thought he slept, and put My clouted brogues from off my feet, whose rudeness Answer'd my steps too loud. On the floor, with his arms together like this. I thought he was sleeping, and took my heavy shoes off my feet because they made my steps too loud. Why, he but sleeps: If he be gone, he'll make his grave a bed; With female fairies will his tomb be haunted, And worms will not come to thee. He's only sleeping. If he's gone, we'll make his grave a bed. May only female fairies haunt his tomb, so that worms won't come. With fairest flowers Whilst summer lasts and I live here, Fidele, I'll sweeten thy sad grave: thou shalt not lack The flower that's like thy face, pale primrose, nor The azured harebell, like thy veins, no, nor The leaf of eglantine, whom not to slander, Out-sweeten'd not thy breath: the ruddock would, With charitable bill,—O bill, sore-shaming Those rich-left heirs that let their fathers lie Without a monument!—bring thee all this; Yea, and furr'd moss besides, when flowers are none, To winter-ground thy corse. I'll decorate your sad grave with the most beautiful flowers while it's still summer and I still live here, Fidele. You'll have the flower that's like your face, pale primrose, and the harebell as blue as your veins, and the eglantine, which it's no slander to say is not sweeter than your breath was. A robin would kindly bring you all these flowers in his bill, making those heirs who inherit a lot of money and don't build a tomb for their fathers ashamed! Yes, and soft moss too, when their are no flowers, to make your body ready for winter. Prithee, have done; And do not play in wench-like words with that Which is so serious. Let us bury him, And not protract with admiration what Is now due debt. To the grave! Please, stop talking, and don't play around with girlish words about something so serious. Let's bury him, and not keep being amazed about something that's over and done with. To the grave! Where will we bury him? Next to our mother, good Euriphile. Be't so: And let us, Polydore, though now our voices Have got the mannish crack, sing him to the ground, As once our mother; use like note and words, Save that Euriphile must be Fidele. All right. And let us, Polydore, even though our voices have changed, sing goodbye to him as we did with our mother. Let's use the same tune and words, substituting Fidele for Euriphile. Cadwal, I cannot sing: I'll weep, and word it with thee; For notes of sorrow out of tune are worse Than priests and fanes that lie. Cadwall, I can't sing. I'll cry and talk with you. But sad songs out of tune are worse than lying priests and temples. Great griefs, I see, medicine the less; for Cloten Is quite forgot. He was a queen's son, boys; And though he came our enemy, remember He was paid for that: though mean and mighty, rotting Together, have one dust, yet reverence, That angel of the world, doth make distinction Of place 'tween high and low. Our foe was princely And though you took his life, as being our foe, Yet bury him as a prince. I see that a greater sadness makes you forget a lesser one, because Cloten has been completely forgotten. He was a queen's son, boys. And although he came as our enemy, remember that he paid for that. Although high and low people rot into the same dust, still, respect for higher classes distinguishes high and low people while they are alive. Our enemy was a prince and although you took his life because he was your enemy, you should bury him in a way fitting for a prince. Pray You, fetch him hither. Thersites' body is as good as Ajax', When neither are alive. Please, fetch him. Thersites's body is as good as Ajax's when they're both dead. If you'll go fetch him,We'll say our song the whilst. Brother, begin. If you go fetch him, we'll say our song while you're gone. Brother, you begin. Nay, Cadwal, we must lay his head to the east;My father hath a reason for't. No, Cadwal, his head has to point east. My father has some reason for that. Come on then, move him. Fear no more the heat o' the sun, Nor the furious winter's rages; Thou thy worldly task hast done, Home art gone, and ta'en thy wages: Golden lads and girls all must, As chimney-sweepers, come to dust. And have gone home and collected your pay. Like dandelions, turn into dust. Fear no more the frown o' the great; Thou art past the tyrant's stroke; Care no more to clothe and eat; To thee the reed is as the oak: The sceptre, learning, physic, must All follow this, and come to dust. You are safe from a tyrant's punishment. Don't worry anymore about finding clothes and food. Now sticks are the same thing as oak trees to you. All turn to dust in the same way. Don't be afraid of lightning bolts. Or the thunder that everyone is afraid of. Don't be afraid of slander or thoughtless criticism. You're through with joy and sighing. All lovers young, all lovers mustConsign to thee, and come to dust. Turn themselves in to you, and turn to dust. May no exorcist harm you! And no witchcraft cast a spell on you! May restless ghosts leave you alone! May nothing evil come near you! Quiet consummation have;And renowned be thy grave! And may your grave be famous! BELARIUS re-enters, carrying CLOTEN's body. We have finished our ceremony. Come on, set him down. Here's a few flowers; but 'bout midnight, more: The herbs that have on them cold dew o' the night Are strewings fitt'st for graves. Upon their faces. You were as flowers, now wither'd: even so These herblets shall, which we upon you strew. Come on, away: apart upon our knees. The ground that gave them first has them again: Their pleasures here are past, so is their pain. Here are a few flowers. We'll pick more around midnight. Plants that have cold nighttime dew on them are the most appropriate decorations for graves. Put them on their faces. You used to be like flowers, and have wilted. These plants we are scattering on you will too. Come on, let's go. Let's pray elsewhere. The earth that they came from now holds them again. Their joys here are past, and so is their pain. BELARIUS, GUIDERIUS, and ARVIRAGUS exit. [Awaking] Yes, sir, to Milford-Haven; which is the way?— I thank you.—By yond bush?—Pray, how far thither? 'Ods pittikins! can it be six mile yet?— I have gone all night. 'Faith, I'll lie down and sleep. But, soft! no bedfellow!—O god s and goddesses! [Waking up] Yes, sir, how do I get to Milford-Haven?—Thank you.—Past that bush?—How far away is it?—God, can it be another six miles?—I've walked all night. I'll lie down and sleep. But wait! Not with anyone!—Oh gods and goddesses! These flowers are like the pleasures of the world; This bloody man, the care on't. I hope I dream; For so I thought I was a cave-keeper, And cook to honest creatures: but 'tis not so; 'Twas but a bolt of nothing, shot at nothing, Which the brain makes of fumes: our very eyes Are sometimes like our judgments, blind. Good faith, I tremble stiff with fear: but if there be Yet left in heaven as small a drop of pity As a wren's eye, fear'd gods, a part of it! The dream's here still: even when I wake, it is Without me, as within me; not imagined, felt. A headless man! The garments of Posthumus! I know the shape of's leg: this is his hand; His foot Mercurial; his Martial thigh; The brawns of Hercules: but his Jovial face Murder in heaven?—How!—'Tis gone. Pisanio, All curses madded Hecuba gave the Greeks, And mine to boot, be darted on thee! Thou, Conspired with that irregulous devil, Cloten, Hast here cut off my lord. To write and read Be henceforth treacherous! Damn'd Pisanio Hath with his forged letters,—damn'd Pisanio— From this most bravest vessel of the world Struck the main-top! O Posthumus! alas, Where is thy head? where's that? Ay me! where's that? Pisanio might have kill'd thee at the heart, And left this head on. How should this be? Pisanio? 'Tis he and Cloten: malice and lucre in them Have laid this woe here. O, 'tis pregnant, pregnant! The drug he gave me, which he said was precious And cordial to me, have I not found it Murderous to the senses? That confirms it home: This is Pisanio's deed, and Cloten's: O! Give colour to my pale cheek with thy blood, That we the horrider may seem to those Which chance to find us: O, my lord, my lord! These flowers are like the pleasures of this world, and this bloody man is like the sadness in it. I hope I'm dreaming. I thought I lived in a cave, and was a cook for honest men. But that's not true. It was a lightning bolt that came from nowhere and hit nothing, invented by my brain. People's eyes are sometimes as bad as their judgement. Goodness, I'm still trembling with fear. But if there is still left in heaven a drop of pity as small as a bird's eye, please give me a part of it, gods! The dream's still here. Even when I wake up, it's outside me as well as inside. I can feel it, not just imagine it. A headless man! Posthumus's clothes! I recognize the shape of his leg. This is his hand. His foot like Mercury's. His thigh like Mars's. His muscles like Hercules's. But his Jove-like face—oh gods!—how could this be—it's gone. Pisanio, may all the curses Hecuba threw at the Greeks, added to mine, be thrown at you! You plotted with that strange devil, Cloten, to kill my lord in this way. May writing and reading be considered treason from now on! Damned Pisanio with his fake letters - damned Pisanio - knocked the main mast off the best ship in the world! Oh Posthumus! Where is your head? Where is it? Where is it? Pisanio could have stabbed you in the heart and left your head on. How could this happen? Pisanio? It's him and Cloten. Resentment and the desire for money made them do this. Oh, I see how it went! The drug he gave me, which he said was effective and would make me feel better—didn't it knock me out? That confirms it. Pisanio did this, and Cloten! Oh! I'll put your blood on my pale cheek so that we seem more frightening to anyone who happens to see us. Oh, my husband, my husband! She falls on the body. LUCIUS, a Captain and other Officers, and a SOOTHSAYER enter. To them the legions garrison'd in Gailia, After your will, have cross'd the sea, attending You here at Milford-Haven with your ships: They are in readiness. The troops stationed in Gallia, as you asked, crossed the sea to meet you here in Milford-Haven with your ships. They're ready. But what have you heard from Rome? The senate hath stirr'd up the confiners And gentlemen of Italy, most willing spirits, That promise noble service: and they come Under the conduct of bold Iachimo, Syenna's brother. The senate encouraged those remaining at home and the noblemen of Italy, willing fighters who will serve well. They are coming under the leadership of brave Iachimo, the Duke of Siena's brother. When do you expect them to get here? With the next benefit o' the wind. When the next wind blows this way. This forwardness Makes our hopes fair. Command our present numbers Be muster'd; bid the captains look to't. Now, sir, What have you dream'd of late of this war's purpose? They're early, which is a good sign for us. Muster our troops. Ask the captains to do that. [To the SOOTHSAYER] Now, sir, what have you dreamed about the outcome of this war? Last night the very gods show'd me a vision— I fast and pray'd for their intelligence—thus: I saw Jove's bird, the Roman eagle, wing'd From the spongy south to this part of the west, There vanish'd in the sunbeams: which portends— Unless my sins abuse my divination— Success to the Roman host. Last night the gods themselves showed me a vision. I had fasted and prayed for news from them. I saw Jove's bird, the Roman eagle, fly from the marshy south to this part of the west and vanish into the sun. This means, unless my sins make me interpret this wrong, that the Roman army will win. Dream often so, And never false. Soft, ho! what trunk is here Without his top? The ruin speaks that sometime It was a worthy building. How! a page! Or dead, or sleeping on him? But dead rather; For nature doth abhor to make his bed With the defunct, or sleep upon the dead. Let's see the boy's face. May you often dream that, and never be wrong about it. Wait! Whose body is here without a head? What's left of this ruined building seems to show that it was once noble. A page boy! Dead or sleeping? Dead probably, because it isn't natural to sleep next to or on dead people. Let's see the boy's face. He'll then instruct us of this body. Young one, Inform us of thy fortunes, for it seems They crave to be demanded. Who is this Thou makest thy bloody pillow? Or who was he That, otherwise than noble nature did, Hath alter'd that good picture? What's thy interest In this sad wreck? How came it? Who is it? What art thou? Then he'll tell us about this body. Young one, tell us what happened to you, because it's impossible not to ask. Who is this you're using as a bloody pillow? Or who was it who did this to him so unnaturally? What do you have to do with this tragedy? How did it happen? Who is it? Who are you? I am nothing: or if not, Nothing to be were better. This was my master, A very valiant Briton and a good, That here by mountaineers lies slain. Alas! There is no more such masters: I may wander From east to occident, cry out for service, Try many, all good, serve truly, never Find such another master. I'm no one, or if not, I wish I were. This was my master, a very brave and good British man, killed by mountain bandits. There are no more masters like this one. I could wander from east to west, calling out I wanted to serve someone, try many masters, all good, serve them well, and never find another master like this one. 'Lack, good youth!Thou movest no less with thy complaining thanThy master in bleeding: say his name, good friend. Poor young man! You're making me as sad by complaining as your master is by bleeding. Tell me his name, good friend. If I do lie and doNo harm by it, though the gods hear, I hopeThey'll pardon it.—Say you, sir? If I lie and don't hurt anyone by doing it, even though the gods hear, I hope they'll forgive me. What did you say, sir? Thou dost approve thyself the very same: Thy name well fits thy faith, thy faith thy name. Wilt take thy chance with me? I will not say Thou shalt be so well master'd, but, be sure, No less beloved. The Roman emperor's letters, Sent by a consul to me, should not sooner Than thine own worth prefer thee: go with me. You show yourself to be exactly what that name means: faithful. Your name fits your faithfulness well, your faithfulness fits your name. Will you take your chances with me? I won't say I'll be as good a master, but be sure I won't love you any less than he did. Even if the Roman emperor sent a consul to me with a letter praising you, it wouldn't make me value you any more than your own virtue does. Come with me. I'll follow, sir. But first, an't please the gods, I'll hide my master from the flies, as deep As these poor pickaxes can dig; and when With wild wood-leaves and weeds I ha' strew'd his grave, And on it said a century of prayers, Such as I can, twice o'er, I'll weep and sigh; And leaving so his service, follow you, So please you entertain me. I'll follow you, sir. But first, if it's all right with the gods, I'll hide my master from the flies, as deep as I can dig with my hands. And when I have covered his grave with wild leaves and plants I'll say a hundred prayers over it, the ones I know, twice, and cry and sigh. And leaving his employment in that way, I'll follow you if you would like to employ me. Ay, good youth! And rather father thee than master thee. My friends, The boy hath taught us manly duties: let us Find out the prettiest daisied plot we can, And make him with our pikes and partisans A grave: come, arm him. Boy, he is preferr'd By thee to us, and he shall be interr'd As soldiers can. Be cheerful; wipe thine eyes Some falls are means the happier to arise. Good young man! I wish I were your father instead of your master. My friends, the boy has shown us how to be a man. Let's find the prettiest patch of daisies we can and dig him a grave with our spears and poles. Come on, give him a weapon. Boy, you've given him a good recommendation and he will be buried as well as soldiers can manage. Cheer up. Wipe your eyes. Some misfortunes lead to situations that make you happier. Doyle, Clio. "Cymbeline Translation." LitCharts. LitCharts LLC, 19 May 2017. Web. 24 Apr 2019. Doyle, Clio. "Cymbeline Translation." LitCharts LLC, May 19, 2017. 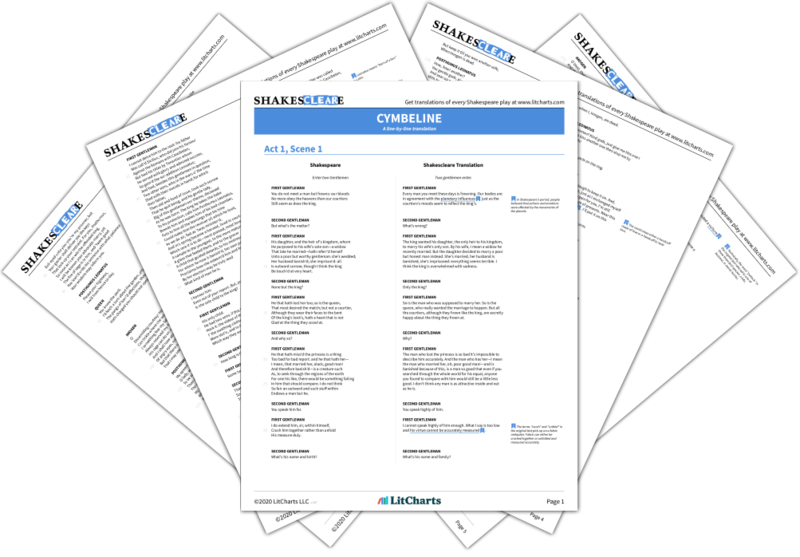 Retrieved April 24, 2019. https://www.litcharts.com/shakescleare/shakespeare-translations/cymbeline.